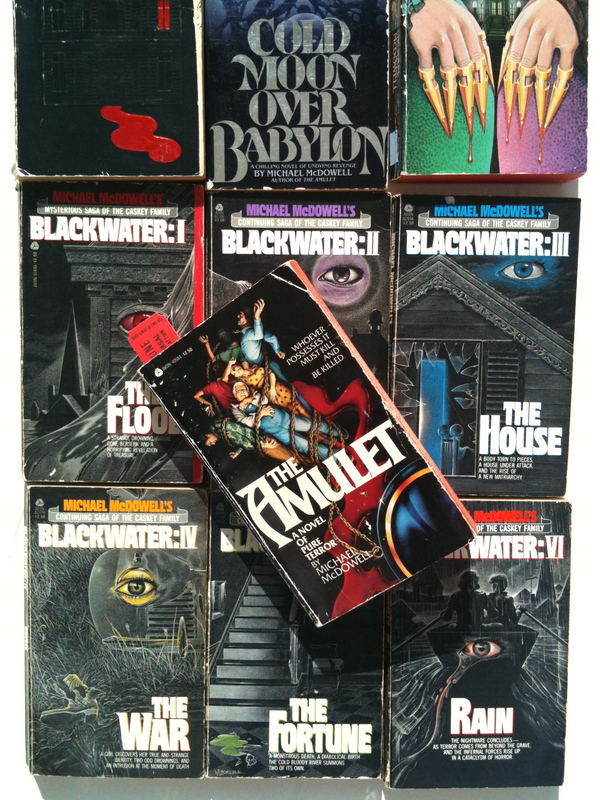 At a time when Stephen King was jump-starting a phenomenal publishing wave of horror novels, Michael McDowell was one of the few writers who deserved the same attention. While he never had King’s way with a killer hook, he was the better stylist. ‘I am a commercial writer and I’m proud of that,’ said the Alabama-born author, ‘I think it is a mistake to try to write for the ages.’ His gothic deep-South novels appeared mainly as paperbacks in the golden age of the throwaway read, the early 1980s, but there’s something about them that remains to haunt the reader. McDowell earned high praise and good sales, producing some thirty volumes including mysteries, comedies, period adventures, psychological suspensers and family epics. He also adopted aliases for two sets of pastiche novels, one featuring a gay detective. Pointedly hailed by Stephen King as ‘a writer for the ages’, his prose was tight and his idiomatic dialogue was shorn of folksiness. McDowell frequently returned to the idea of matriarchal revenge in his books, and his wonderfully conversational style made it feel as if he was imparting a terrible piece of gossip while describing all manner of disturbing events. It is generally accepted that his best book was ‘The Elementals’, in which two families fatefully clash during a summer holiday on a spit of land being slowly engulfed by tides and mournful spirits. 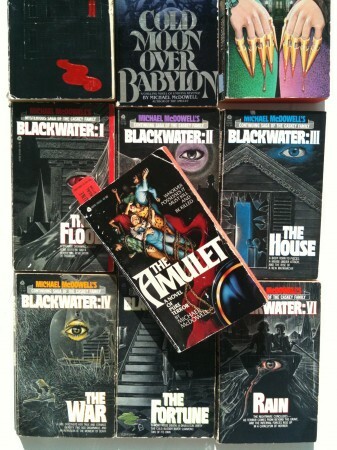 Personally, I prefer his six volume ‘Blackwater’ saga, which chronicles a tragic fifty year period in the lives of the Caskey family, whose women bear a strange affinity for running water, and whose vengeance knows no bounds. The saga plays out like a gruesomely overheated Dickensian soap, and is constructed for maximum page-turning efficiency. Surely they’re ripe for republication? ‘Cold Moon Over Babylon’ is set in the harvest season of a foggy Southern town, and has a marvellous feel for its location. McDowell frequently returns to the idea of being engulfed by natural forces, as the levees break and the seas rise, as sand pours in through the windows of an abandoned house, and he links these natural catastrophes to our own selfishness or blindness, flaws that leave dark stains on future generations. His characters are often powerless and insignificant in the face of time and nature. ‘The Amulet’ captures the close-to-the-bone poverty of a small town beset by tragedy; its heroine works on a production line making the rifles that will eventually destroy her husband. McDowell was a creator of highly visual images, and wrote the film ‘Beetlejuice’, also collaborating on ‘The Nightmare Before Christmas’. Even when outlining horrific acts, there’s a gentility and grace to McDowell’s prose. He died shortly before his fiftieth birthday. All of his books are out of print, although I recently spotted four volumes of ‘Blackwater’ in a secondhand bookshop in Brighton. I am a fan of Stephen King. I can’t say anything about Michael McDowell. But I think Christopher Fowler is the best follower of Stephen King’s style. I used to be a huge fan, and still think King has a wonderfully fertile imagination, but I also love stylish writing and sometimes find his prose very flat. There are a great many terrific writers who owe their break to him, though. Didn’t you do a previous piece on McDowell, in this blog? I remember chiming in in favour of this far too overlooked author, and remarking that his unfinished novel “Candles Burning” had been recently completed by Tabitha King, who had made a right mess of it: great McDowell beginning, rollicking, ironic and grotesque, and then we switch to a charming and peaceful narrative on the growing up of a teen by the sea, totally disconnected from the early pages of the books, all of which ends with a vague and unconvincing tying-up of loose ends in the last pages, obviously as an afterthought. “Gilded Needles” whose cover appears at the top of your illo, is another fine, historical horror novel, and I rather love the trashy wit of the two novels he co-wrote under the pseudonym Axel Young, “Wicked Stepmother”and “Blood Rubies”. Wicked fun, both. And “Toplin”, a short novel inspired by Camus’ “The Stranger” adopts a chilling point of view through the eyes of an obvious madman. I almost feel like the more recent King books are written by someone else. The style of Carrie and Christine is just so different to Under The Dome, or Lisey’s Story, for example. I loved Carrie, Cujo, Christine, The Dead Zone, etc, etc, these were classic and easy reads, with richly drawn characters and clever plotting, etc. I just cannot say the same for King’s recent tomes, the style is wooden compared, but Kudos to the man, he made common sense writing come alive! King is a good read, but he was a writer of his time (the ‘seventies, eighties and nineties), the popular style out there now is completely different once again, I sometimes think that King books are these days ignored?